Welcome to eFIL: Filipino Digital Archives and History Center of Hawaii. 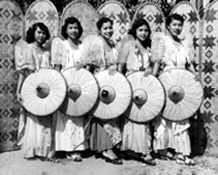 On our website you will find resources about Filipinos and the Filipino experience in Hawaii. 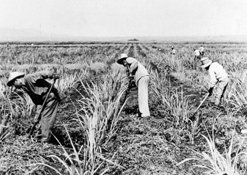 We focus on Filipinos in Hawaii because Hawaii's relative geographic isolation from other large land masses presents a unique physical and social environment in which people have created and lived their lives. On the other hand, the migration of peoples from the Philippine archigelago to Hawaii is part of a larger and continuing story of global migration. Besides Filipinos, many groups of people from different origins have migrated to and settled in Hawaii over the recorded and unrecorded centuries: Austronesians (including Polynesians), Europeans (including Anglo-Americans), Asians (including Chinese, Japanese, Koreans) and many others. Each group has impacted and modified the physical and social landscape of Hawaii. Unfortunately, the memory and, thus, the story of each group's contributions to present-day Hawaii is not equally appreciated or preserved. New additions to GUMIL Hawaii publications collection. Visit our News and Updates Page for other new materials. eFIL's mission is to help set the conditions and provide the necessary building blocks for students, educators, researchers and general public to develop an awareness and appreciation of Filipinos in Hawaii's history. eFIL is a new project of the Filipino-American Historical Society of Hawaii, a 501(c)(3) non-profit organization, and in partnership with the Filipino Community Center of Hawaii and the University of Hawaii at Manoa Office of Multicultural Student Services. We welcome your support in maintaining this website. Click on the following link to make a donation through JustGive.org: DONATE NOW.